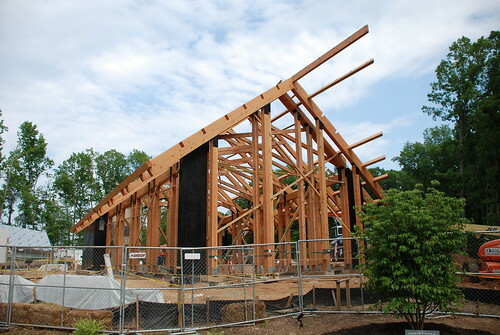 Scuttlebutt Fuzz: Chapel Progress- - Big Changes! 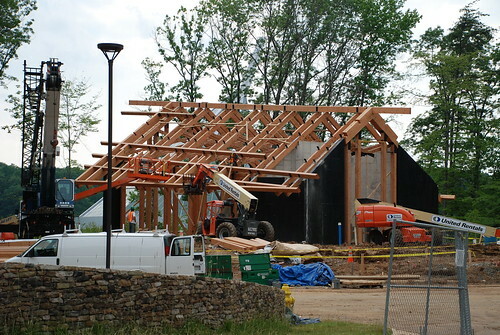 Chapel Progress- - Big Changes! 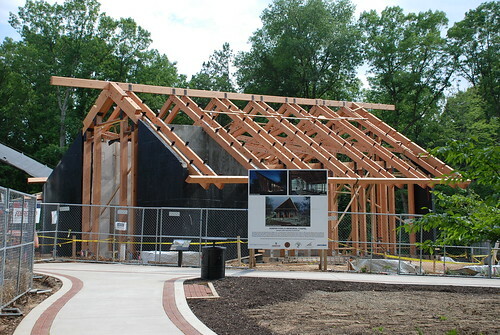 The beams for the walls and the roof are up, its all framed, how exciting! 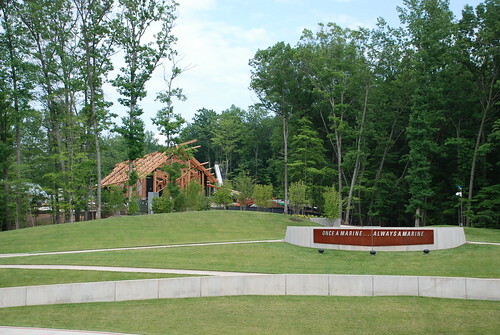 Below is the view as I walk up the walkway in Semper Fidelis Memorial Park. The wall we are looking at from this point is the back wall where the alter will be. Below is a side view, you can see the concrete foundations for the benches or pews. The Chapel will seat about 60-70 people, so it is very intimate. I think this is the marble for the pews/benches and maybe the alter. 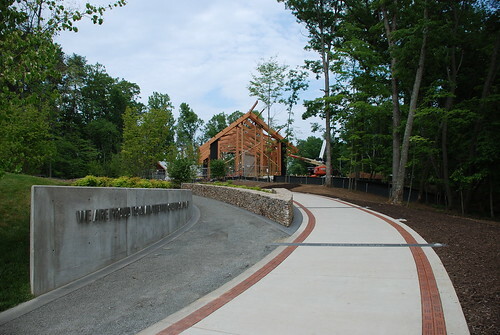 This is the view looking toward the entrance of the Chapel from the path in Semper Fidelis Memorial Park. This is the view of the front entrance from the access road across from the entrance to the parking lot. Yes, I wasn't suppose to be there and yes, the security guard did stop me as I was walking up the access road. Other than crossing the road blocks, I didn't cross over into any construction/hard hat fenced in sites, nor did I touch anything. Just took this picture. According to the Chief of Visitor's Services, the traditional topping ceremony was Friday June 12th. Pat said they hoist a pine tree up like a steeple and raise a US flag to the top. Sgt. Kelli of the museum Marine detachment had the honors of running the flag up the 'steeple'. Since I haven't won the lottery yet (I really need to play and then actually check my numbers) I still have a day job so missed that ceremony. 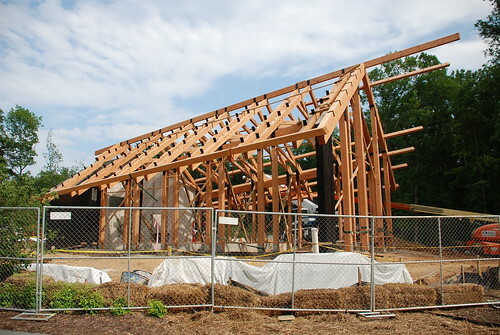 The Chapel is slated to be opened/dedicated in October. I hope to be on hand for that. I can't wait to see what is next! I have not been able to read in awhile - but thanks for the progress update! 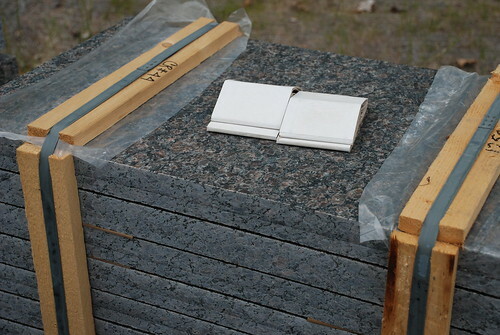 The stone for the Chapel is Granite, not marble. What the heck?!? Am I blind?